A Community Drum Circle is great for any occasion! 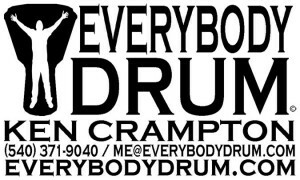 Ken Crampton / Everybody Drum works with thousands of individuals from private lessons to HUGE drum circles! We travel worldwide Learning, Facilitating and Teaching people to Build Community through Rhythm and the Arts! 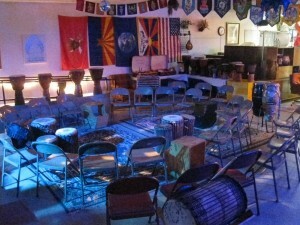 Everybody Drum holds a FREE Community Drum Circle once a month at Eyeclopes Studios in Historic Downtown Fredericksburg. Eyeclopes – 620 Charlotte Street – Fredericksburg, VA 22401 (click for directions) (click to see our calendar) Our Drum Circles are open to any individual and family. Please Join us for a Community Drum Circle, grab your drums, shakers, clickers and scrapers! And let’s jam! There is a chair for you, your family, friends and those you have yet met! Don’t have an instrument? No worries! We are a full blown drum and percussion shop! Plenty to play with! Doors Open 6:30pm – Drum Circle 7:00-9:00pm. Please bring your own snacks and beverages.